Local and legacy are two adjectives that perfectly describe Straub Brewery. Set in the heart of the Pennsylvania Wilds (that’s up north in Allegheny County near Pittsburgh), the brewery has been owned and operated by the Straub Family since 1872. 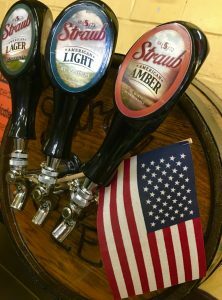 Straub is one of only a handful of breweries that can claim the designation American Legacy Brewery™ which celebrates the family’s 145 years of fierce brewing independence. Most importantly though, the designation represents Straub’s historic contribution to the production of authentic, American lagers and its commitment to the preservation of a way of life where brewing beer is the soul of a community. The brewery’s flagship beer, Straub American Lager, won a gold medal at the 2016 U.S. Open Beer Championship. In honor of that accomplishment, Draught Lines reached out to CEO Bill Brock – the fifth generation of his family to run the brewery, to find out how a 21st century brewery stays true to its heritage, its region and its history. D.L. How did it feel to take home a gold medal? B.B. Great! Straub American Lager is made using the same recipe (and the same brewing process) Peter Straub perfected in the 1870s. It’s hand-crafted with 100% natural ingredients – no sugars, no salts, no preservatives. But hey, you forgot to congratulate us on the bronze Straub Light won at the same competition. D.L. Sorry about that. Congratulations! Now tell us about Straub American Lager. The beer has historic significance. B.B. Straub’s history, my family’s history, is essentially the story of lager beer in America. British colonists drank ales. German immigrants, like Peter Straub, brought lagers to the new world. And then they had to learn how to make them without the malts available to them in Europe. That’s why some lagers contain adjuncts like corn. It wasn’t about substituting cheaper ingredients; it was about trying to get it to taste like the beer brewed in Germany. D.L. Didn’t Straub Kölsch win a bronze at the last World Beer Cup, too? D.L. Are your beers really handcrafted? B.B. Oh, yeah. Our brewery isn’t uber-mechanized. The system is still gravity fed and much of the work is done manually. By the time a consumer gets one of our beers, it’s been touched by five or six employees. And we are going to keep it that way because people need jobs. Antique copper grant used to make Straub beer since the 1900s. 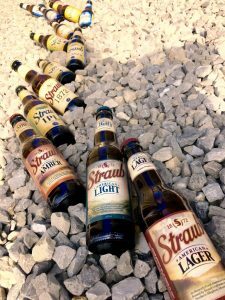 What makes Straub a “legacy” brewery? D.L. 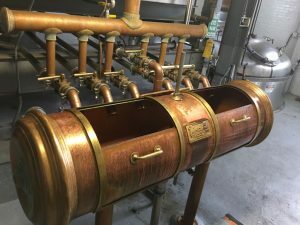 What makes Straub a “legacy” brewery? B.B. Like Yuengling, it’s a brewery founded before Prohibition that has always been family owned and operated. We all started as regional breweries back in the 1800s when our German ancestors came to this country and began brewing the lagers they enjoyed back home. D.L. Why did they settle in St. Marys? B.B. A group of German Catholics had settled in another part of this country – somewhere in the south. They feared that they would not be able to practice their religion freely so they bought the land, sight unseen, and settled in Pennsylvania. Luckily the water here is great for making beer. D.L. As the CEO of a legacy brewery, is your job description different from someone at the helm of a big company like Budweiser, for example? B.B. Absolutely. First of all, Straub is still a family business and I am just holding the keys for the next generation. My job is to put the resources in place to brew great beer, take care of our employees and leave the sixth generation of Straubs a business that’s in good financial shape. D.L. What was it like to grow up in a family that owns a brewery? B.B. It was the best! But you have to understand that the Straubs don’t ‘just’ own a brewery. Brewing beer is a way of life for us. It’s like baking our daily bread. And my house, my grandfather’s house and the houses where my cousins lived, were all within walking distance of the brewery. I could smell the beer being brewed every day. I could see the brewery from my grandfather’s kitchen and I got to play with my cousins all the time. Every memory I have is centered around the brewery. D.L. Is it hard to run a business and preserve a family culture centered on brewing beer? B.B. It’s a privilege really. We decided it wasn’t important for us to become a mega brewery. Our culture is part of what makes us authentic. So we don’t pursue change for the sake of change. But it’s just not about using old recipes. My generation owes so much to those who came before us. It would be tragic to lose the brewing know-how that was taught to apprentice brewers coming up in the business. D.L. Have you been able to modernize? B.B. Sure. We spent millions on quality control and upgraded our facility with American-made equipment. Lots of breweries brag about their German equipment. We think it’s important to support companies that employ Americans. B.B. It’s the ethos of running a family business as instilled in me by my mom… (She’s on the board of directors which means I work for her – and I love it). Without the Straub Brewery and the jobs it provides, there would be no community here. I make decisions every day that impact the people who work here and I want to do the right thing by them. If that means Straub makes a little bit less money one year – so be it. D.L. Tell us about the “Pounder”. B.B. Straub is the only brewery left in America that still accepts returnable long-neck bottles. It’s a 16-ounce bottle that our fans call the Pounder. That’s why the Pennsylvania Resource Council awarded us their Leadership in Reusable Packaging Award late last year. D.L. Finally, what the hell is The Eternal Tap? B.B. This is so not politically correct to say anymore, but to the old-timers, having a beer or two during the work day wasn’t really considered drinking. As I said before, to a Straub, making beer is like baking bread. It’s our liquid bread. Beer was always available to family members working at the brewery. The Eternal Tap is an extension of that tradition. Visitors and brewery personnel may have two servings of Straub beer on the house – as long as they wash their own glass.